Stereotypes are nothing more but the idea that people get from a certain group because of the pattern in behavior, action, and preference. Geeks are people with glasses, freckles, braces, and are walking encyclopedias and calculators who are already in the borderline of insanity. At least that is what the pattern shows and it is what people are lead to believe is true or near reality. 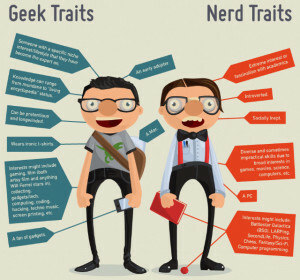 They are also called nerds, brainiacs, etc. Another stereotype familiar to everyone is that blondes are dumb. This stereotype could really hurt people and this is not true altogether. As to how these stereotypes started, I really could not tell. Just that most of the time, stereotypes are quite mean and insulting, and if you are someone who can’t take these kinds of things lightly, and you somehow have been stereotyped, then you will really have a difficult time handling your emotions and you might end up in a fight with other people, because really, stereotypes will continue to exist because human behavior patterns exist. As much as we want to deviate from the norm and be unique, there will still be an aspect of life that will fall into a pattern that can be associated with a stereotype. Another form of stereotyping is by judging people even before meeting them, depending on their work. An example of this is how people stereotype chefs to be fat people. When someone is asked to think of a chef, the picture that comes into mind is that of a fat, round man or woman in a chef’s hat and uniform, slicing away the potatoes or shouting orders at their second in command, grumpy-looking and with casual burns here and there. 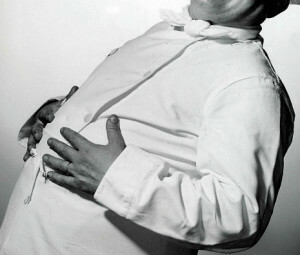 People think that because chefs do nothing all day but cook and taste food and look at food and be surrounded by food, that they would, without a choice, be fat. Food is a chef’s life and therefore it is inevitable to end up eating round the clock. Apparently, while there is no harm in loving food, there is harm in being fat. This harm, can be physical(because fat can cause diseases in the body, not necessarily physical harm from other people), or it can be emotional, which is the case when being stereotyped. You do not get the chance to prove them wrong. No matter how you convince someone that they are wrong, another person would come along and judge you for the same thing. It would be futile to convince everyone because it would be difficult to reach everyone. These patterns in life are what helped form the society we live in today. Seeing pattern in things is a good thing. However, like most things, it also tends to lead us to see patterns that are of negative effect. 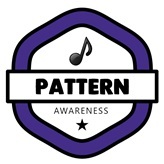 It is up to us to make sure that we do not get easily hurt when we are categorized in a pattern. After all, we should know ourselves better than anyone else and if we are confident about who we really are, stereotype or no stereotype, we will not be easily offended and we can live and enjoy life regardless of what others have to say.